An 'ongoing campaign of harassment' against an elderly couple has seen a Shoreham man given an indefinite restraining order. Ronny Fox, 69, of Downside in Shoreham, received the restraining order after being found guilty of harassment on Monday, January 7, said police. Despite pleading not guilty to the charge, said police, Fox was also ordered to complete 100 hours of unpaid work and pay £100 in compensation to the victim, an £85 victim surcharge and £620 in court costs. The indefinite order follows a two-year restraining order granted in 2014 against Fox relating to harassment of the same victim. Police said his victim complained of anti-social behaviour, including having eggs and chicken skins thrown at his house. According to police, the restraining order appeared to be working and the victim was allowed to live in peace. However, as soon as the restraining order expired, Fox recommenced his harassment with months of verbal abuse and cat calling. The victim contacted police again and an investigation to obtain the evidence used in this conviction was launched, said police. A family member of the victim said the family was relieved that Fox had been convicted for his 'ongoing campaign of harassment' against their 'elderly parents'. The family member said: “The targeted and relentless victimisation they have been subjected to has had a severe impact on us all. “We would like to highly commend PCSO Jamie Sanderson, who has always understood the impact that Mr. Fox’s behaviour was having on our parents. Jamie has shown great empathy, resilience and professionalism; he is a credit to the police force. He has been proactive in keeping us fully updated with any progress on the case and fought for the facts to be heard in court. 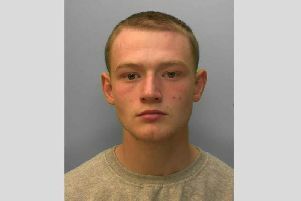 PCSO Jamie Sanderson, of the Adur, Worthing and Horsham Prevention team said: “I am pleased to see that justice has been served at last, and the victim and his family can now look forward to some peace and quiet, free from any further harassing behaviour. “The victim and his family, along with other neighbours, endured this behaviour for far too long, making their everyday lives almost unbearable. “This case has been extremely challenging to bring to court, with various hurdles to overcome along the way, so I am delighted to see that the time and effort invested has been worthwhile.